Urgent note – priority set to high! To the visiting consultant from the Gavena Group assisting us through the desktop actualization and subsequent reauthorization process: You are in need of an immediate and radical hygiene intervention! That mustache should be quarantined and repeatedly washed. With borax. And lemon Pledge. Rule number one of customer relations – LYB (Look Your Best). This should be transparent to you. Ho boy. I think this picture tells the story of how much fun we had at our quarterly staff retention afternoon. Well, actually this looks like we’re having fun. 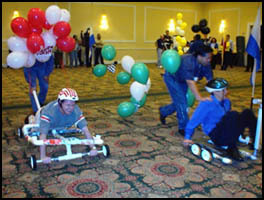 Which I guess Cathy and Mike did racing their balloon speeders. But I was left at Table 14 with Cindy, Manuel, and most of the IT staff. In other words, it was the Knights of the Dork Table. I did enjoy swapping eBay mishaps with Jerry “Steamboat” McCord, but other than that, I could not wait to get back to work. So I guess another Mission Accomplished for the retention team. Way to go. Also, the event snacks were subpar. The Krakatoa Crumble certainly failed to live up to its name and I did not even try the cheese boats.